A year-long examination of federal government documents shows that a company owned by the founders of Google has purchased millions of dollars’ worth of jet fuel at below-market prices from NASA and the Department of Defense. The records show the company, H211, whose principals are also the principals of Google, used the fuel to fly their private airplanes around the world. Local officials in Santa Clara County confirm that the company owned by the Google founders, H211, pays no property taxes on the airplanes that are housed at Moffett—a potential loss to local tax rolls of up to $500,000 per airplane per year. Nearly $8 million worth of jet fuel that sold for as little as $1.68 a gallon was put into a fleet of seven different airplanes and two helicopters that are kept on taxpayer-owned land at NASA's Ames Research Center at Moffett Field. The same jet fuel sells for two to four-and-a-half times that amount, up to $8.05 a gallon, at fixed-base operators at nearby airports in the Bay Area. This was made possible under a NASA Space Agreement which has allowed these planes to be housed at Moffett Field since 2007. In exchange, H211 agreed to pay NASA first $113,365.74 a month in rent. That figure later dropped to $108,938.62 a month in rent and NASA was allowed to use the planes for science. But an examination of records by NBC Bay Area in May 2012 showed that only 155 out of more than 1,039 flights were actually used for science. And these newly released fuel records show the planes used the below-market-rate fuel to fly to exotic places around the world, such as Paris, London, Cancun, Scotland, Puerto Vallarta, St. John, Hawaii, Liberia and Tahiti. Google’s world headquarters are located is less than 3 miles away from the hangar where H211’s airplanes are stored at Moffett Field. 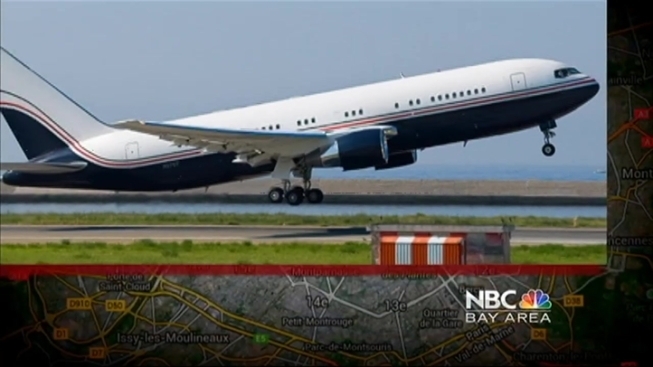 During NBC Bay Area’s investigation into these fuel records, the Defense Department announced that, effective August 31, 2013, the government will no longer sell jet fuel to H211. While the agreement with NASA does not set a specific number of scientific flights that are to be conducted, the deal and the use of fuel directly from the federal government has some in Congress calling for further investigation. Republican Senator Grassley first raised alarms after watching NBC Bay Area’s initial investigation in May 2012, which raised questions about the Space Act Agreement deal between NASA and H211. In light of these new revelations regarding the selling of federal government jet fuel to H211, Senator Grassley is now calling on the Inspector General for both NASA and the Defense Department to investigate. Others are raising questions about the propriety of this deal as well. According to federal records obtained by NBC Bay Area, there were 1,234 different fuelings using Department of Defense fuel alone, totaling 2,237,293 gallons at a cost of $6,716,513.05 dating back to April 7, 2009. Those same records show H211 purchased fuel 106 times from NASA from 2007 until April, 2007, paying a total of $1,174,662.35. An analysis of those records by NBC Bay Area also shows H211 paid anywhere from $1.68 a gallon to $3.79 a gallon from April, 2009, through April, 2013. That’s two to four and a half times cheaper than the same jet fuel would have cost at local fixed base operators at area airports. In all, between the two federal agencies, the records show H211 purchased $7,891,175.35 in jet fuel at below-market rates. One example: September 21, 2009, a Boeing 757-23A owned by H211 gassed up at Moffett Field. On September 22, 2009, FAA records show the same Boeing 757 taking off from Moffett Field bound for Puerto Vallarta, Mexico. According to the fuel records, H211 paid $2.37 a gallon for 2,218 gallons of jet fuel. That same jet fuel would have cost $5-to-$8.50 a gallon, according to records from several fixed-base operators at local airports. Another example: On October 29, 2010, fuel records show the same 757 getting 4,223 gallons of jet fuel at a cost of $3.27 a gallon. On November 1, 2010, FAA records show that same plane leaving Moffett Field and flying to Juan Santamaria International Airport in San Jose, Costa Rica. Paul Asmus runs a non-profit, Human Air Logistics, based in Palo Alto. He was denied permission to base his operation at Moffett. Through a FOIA request, Asmus first obtained these fuel records showing exactly how much H211 has paid for fuel in the last six years. Asmus shared those records with NBC Bay Area. NBC Bay Area’s Investigative Unit then independently verified those records for their accuracy with federal officials. Other records show: A 767 owned by H211 fueled at least 100 different times at Moffett for a total of 442,370 gallons. FAA records show that 767 aircraft fueled at Moffett before making trips to Paris, Cancun, Switzerland twice, and Tahiti three times. Four Gulfstream jets fueled 404 different times, purchasing 919,656 gallons. Those Gulfstreams then made trips to places such as Hawaii, Scotland, St. Martin, Ireland, Great Britain and France. You can read the entire NASA statement here. “H211 aircraft buy the only fuel available at Moffett, which monopoly fuel is managed by the Defense Logistics Agency. We are not a party to the agreements and understandings between DLA / DFAS and NASA, and the DLA invoices we receive and pay include all applicable taxes. We have not sought a tax exemption, even for the dedicated NASA missions we conduct. Our presence at Moffett has been criticized, analyzed, and investigated by a variety of public and private groups nearly every year of our seven year lease term. The bottom line is we pay full retail for hangar space that includes none of the ground support typically included at business aircraft hangars. Further we conduct a robust research flight schedule that has become the most consistently reliable airborne science program at any NASA facility. Between rent, capital improvements, and science flying, NASA and the taxpayers are $ 2 million to the good by the H211 presence at Moffett." Federal records show a helicopter owned by Ambrose, not by H211, was refueled 138 times with 7,078 gallons of DoD fuel out at Moffett field. Cheap fuel isn’t the only benefit H211 receives by housing its fleet of airplanes at NASA’s Ames Research Center. Google’s founders get a local property tax break too. Santa Clara County Assessor Lawrence Stone’s office assesses and sends out the bill for all local property taxes. But there’s a loophole in the law disallowing the tallying of any property kept on Federal property. That allows H211 to bypass this local tax property process. Assessor Stone. “We don’t know how many planes they have. It’s been rumored they have seven or eight, but we have no way of knowing. In fact, federal records obtained by NBC Bay Area show as many as seven different airplanes and two different helicopters have located and bought Federal Government fuel at Moffett Field. That means that H211 and Google’s founders pay no county taxes on any of those airplanes because they sit at a federal facility. “In 2008 and 2009 they had three planes/aircraft that was domiciled at San Jose Mineta Airport, and so we were able to assess those. They each were worth between $40 and $45 million,” Stone said. That means a loss to local residents of between $400,000 and $500,000 in property taxes per plane per year, according to Assessor Stone. It might be legal, but is it fair? Congresswoman Anna Eshoo’s district includes Moffett Field. Last summer, NBC Bay Area asked her about the relationship between NASA and H211. More than two weeks before going to air and publishing this story, NBC Bay Area asked to speak with the congresswoman again, this time in more detail about the fuel subsidy. However, her staff said she was too busy to answer any questions on camera about the deal or what NBC Bay Area’s Investigative Unit uncovered. Click here to read the updated statement from Representative Eshoo.